Welcome to another installment of the Borderlands History Interview Project. We have been away too long, but we’ve been thinking about you! Today, we are offering a fantastic interview with Dr. Monica Perales, Associate Professor at the University of Houston. She received her B.A. and M.A. from the University of Texas at El Paso, and went on to complete her Ph.D. in history at Stanford University. She is also the author of Smeltertown: Making and Remembering a Southwest Border Community and the forthcoming article “The ‘New Mexican Way’: The New Mexico Agricultural Extension Agency, Hispanas, and Making a Regional Cuisine,” in Meredith Abarca and Consuelo Salas, eds., Latinas/os’ Invisible and Visible Presences in the Food Systems: Changing How We Eat and Who We Are. The first time I met Monica Perales was at the Barnes and Noble bookstore on Sunland Park Drive in El Paso, Texas in 2010 where I waited patiently in-line for her to sign my copy of Smeltertown. She was kind and warm and invited me to write her if ever I had any questions about El Paso history. I saw her next at the Pacific Coast Branch American Historical Association meeting in Denver, Colorado in 2013. She presented a marvelous paper about the intersections of family, memory, recovery, and history. During our recent meeting at the Women’s Association of Western Historians annual conference in Sacramento, California we discussed the significance of this paper, as well as her book, articles, and current projects. In her attempt to understand the trajectory of her family, their lives on the U.S.-Mexico border, and their world built amidst smoke stacks and a smelting company, Perales’s paved her way to becoming a historian. 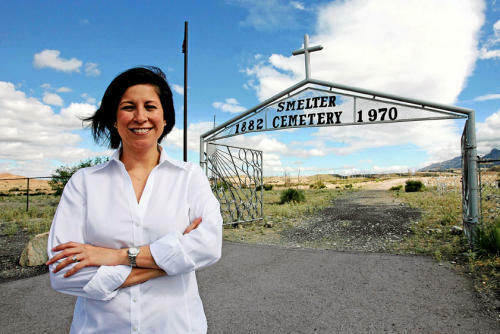 Perales wanted to understand the legacy of her family and their connections to Smeltertown, a smelting community built in El Paso, Texas—a place that had been “demolished before [she] was born.” In recuperating the memories of her family, she began to piece together the lives, struggles, and legacy of an entire community. Without a “formal” archive, Perales used what information she could gather from the smelter company, along with the words and pictures of those people who had created their homes along the edges of this sprawling industrial zone. Her research led her to ask greater questions about the intersections of borderlands, Chicano/a, and transnational history. As Perales began to untangle the history of Smeltertown, she documented the history of Asarco, the large and very powerful smelting company that also owned shipping and railroad lines, which “connected a vast empire of copper and metal processing” across the border into Mexico and far into the South American continent. Beyond the movement of natural resources, the processing of metals, and capital accumulation, Perales sought to link these major economic forces to the communities whose labor brought this industry to life. The idea that the local affects the global and vice versa, pushed Perales to think about her project more broadly. “These folks living on the banks of the Rio Grande are not removed from the wave of industrial capitalism at the turn of the twentieth century and the forces of immigration are set in motion because of this global capitalism…it effects everyday people like my grandparents…”But in the end she saw her project as the history of a Mexican-American community on the border. Perales was inspired by George Sanchez’s classic text Becoming Mexican American. She viewed her project as an extension of Chicano/a scholarship that seeks to understand the making of identity on the border of the United States and Mexico. Perales makes a pressing argument for the study of memory and the ways in which people are allowed to remember their past. “What are the politics of memory?” she asks “How do people get to define what their past is and what that past means in the present and for future generations?” Perales continues, “To me that is really a lesson from Chicano History.” Perales makes a strong call to those of us engaged in the study of the borderlands to utilize methods and questions posed by Chicano/a scholars as a way to reach a more nuanced understanding of borderlands history. We discussed her other articles as well as her current project on FOOD! Like any passionate historian, Perales is expanding her focus to new horizons delving into the history and significance of food in our culture and society. Be sure to watch for her forthcoming article on this fascinating new topic. Join us again for another installment of the BHIP!